If you haven’t already got your hands on a copy, the second part of The Expedition adventure book series is now available in print and ebook formats in the UK and rest of the world. Those left hanging at the end of Dark Waters will find out what happens when you’re run down on an isolated stretch of American highway by the Worshipful Master of the local Masonic Lodge. Does he stop and call for an ambulance? Does he keep driving, later claiming that he thought he’d hit a deer (even though your rucksack has gone through the windshield and is sitting in his wife’s lap), leaving a working-class Hispanic guy to step up to the plate? As The Seed Buried Deep reveals, truth can be stranger than fiction. DESCRIPTION: When adventurer Jason Lewis regained consciousness beside a busy Colorado highway, lower limbs shattered by a hit-and-run driver, he knew he was lucky to be alive. But would he ever walk again, let alone finish crossing North America by inline skates? So begins part two of The Expedition, a stirring saga of hope, determination, and the kindness of strangers as Jason, taken in by the people of Pueblo, spent nine months in rehabilitation, legs pieced together with metal rods, before returning to the spot he was run over and continuing on. USA: available from Amazon.com, BN.com, Books-a-Million, IndieBound and other online outlets listing adventure books. UK: available from Amazon.co.uk, Blackwell’s and Waterstones. AUSTRALIA: from Bookworld and Angus and Roberston. OTHER COUNTRIES: search online or order through your local bookstore using ISBN reference number 0984915516. Those residing in the US and Canada can order signed copies direct from publisher BillyFish Books. The EBOOK version, supplemented with 37 colour photographs, is available on Kindle, Nook, iTunes, Google Play, and Kobo. 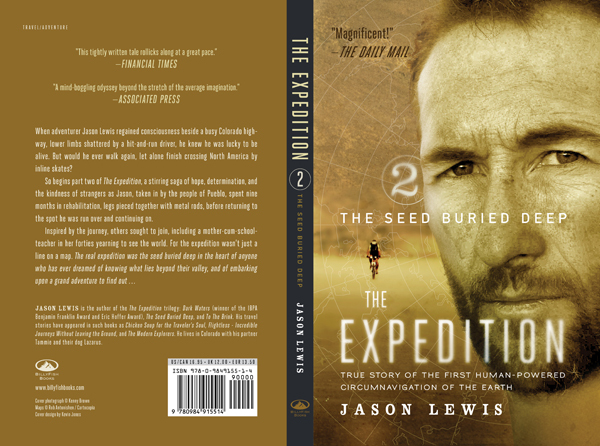 This entry was posted in The Seed Buried Deep excerpts and tagged adventure, circumnavigation, human power, travel, voyages by Jason Lewis. Bookmark the permalink.